24.09.17 11:57;Account;Receive;Received Payment 1.00 USD from account U14972070 to account U1294000. Batch: 189102877. Memo: API Payment. Withdraw to allhyips from 1paycoin.com. 26.09.17 10:26;Account;Receive;Received Payment 1.00 USD from account U14972070 to account U1294000. Batch: 189282196. Memo: API Payment. Withdraw to allhyips from 1paycoin.com. 28.09.17 12:59;Account;Receive;Received Payment 1.00 USD from account U14972070 to account U1294000. Batch: 189500790. Memo: API Payment. Withdraw to allhyips from 1paycoin.com. 30.09.17 10:58;Account;Receive;Received Payment 1.00 USD from account U14972070 to account U1294000. Batch: 189681111. Memo: API Payment. Withdraw to allhyips from 1paycoin.com. 01.10.17 13:01;Account;Receive;Received Payment 1.00 USD from account U14972070 to account U1294000. Batch: 190050078. Memo: API Payment. 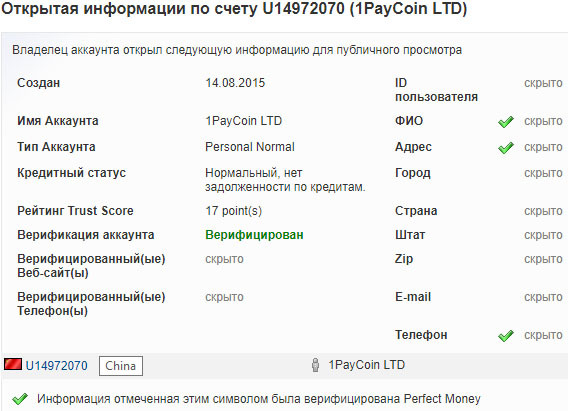 Withdraw to allhyips from 1paycoin.com.